Testimonials. Medical Vita Diet. Lose Weight Fast! Congratulations to Heather for losing 17kgs in 12 Weeks on the Vita Diet! "I bought my first shakes on 27/2/15 from Discount Drug Stores in Highfields QLD, so my weight loss is from then until today. (12 weeks last Friday) My goal for the 12 weeks was 12kgs so I'm really happy! I've gone from a pant size 18 down to 14 so far. I started using the Medical Vita Diet meal replacement shakes in February 2015. I started out at 98.3kgs and by following the Usage Guide I’ve lost 17kgs in just over 12 weeks! I did slow down on my average loss per week after the first month or so but then I re-read the Usage Guide & realised that I hadn’t been doing the half an hour of exercise most days of the week so I started walking 30 mins around my block most days and it picked up again. I drink 1-3 600ml bottles of water a day with a little lemon juice in it to keep up my vitamin C intake and to make the water more interesting. I’ve been using the meal replacement shakes for 2 meals per day and then having lots of vegetable snacks in between meals to stave off any cravings. I feel full all the time & if I’m ever in a situation where I can’t have my shake (dinner parties, group luncheons, etc.) I just pick the healthiest option available, stick to my portion control, drink plenty of water and use that as my main meal for that day and have a shake for the other two. The most important factor for me has been determined persistence. Not berating myself for any perceived excesses and going back to my plan every time. I have a realistic goal in mind and I’m calm & accepting of the fact that it won’t happen overnight. I have an 8 month goal and smaller goals in between. I have tried so many meal replacements before and they all feel like gluggy, slightly watery pudding in the mouth but not the Medical Vita Diet ones! I love chocolate milk and iced coffee so these shakes taste great which makes it easy to choose one for breakfast & lunch without being tempted by anything else in the kitchen that tastes familiar but with many more calories in it. Being a busy mum of 4 elementary school age girls and partner in a business, I need a quick, easy meal for those busy times so I can work and eat on the go and have peace of mind that I’m not adding to my weight problem – I’m solving it! People embarking on The Medical Vita Diet can expect to lose a kg a week though some dieters lose more than this. Tania proved the norm. 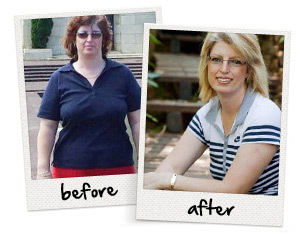 Under the watchful eye of consultant Jennifer , and by following the Medical Vita regime of fresh food and proteins, supplements twice a day and exercise, she lost 21 kgs in 21 weeks. Tania also shed 135.5 cms along the way. Weight is of course a very important indication of weight loss but so too is measurement. When Sue embarked on the Medical Vita Diet program she was thrilled to lose nearly a kg a week, and just as excited to lose 72cms in her measurements which meant she went down several dress sizes!! Sue was monitored every week for weight and measurements by consultant Jennifer. "I gained weight while pregnant and not due to any health problems. I was simply too lazy during my pregnancy. It was so nice to just use the excuse that I was eating for two. I knew I was bigger than I was supposed to be when I was 2 kg off my partner at my heaviest point. I breastfed for six months and once our son was weaned I decided it was time to get myself into shape. I started taking the Medical Vita Diet shakes, as well as doing 30 min exercise every weekday morning. I went from 86 to 62kg in two and a half months. What I found amazing was that in the first two weeks I lost 4kg a week. I averaged losing 3kg a week for the rest of those weeks!! It was simply thrilling to jump on the scales every Friday morning and see those numbers just keep going down. And even more exciting to have the shorts and pants feel loose and looser on me. I dont think I could have done it without the Medical Vita shakes. I lost 24kg and am back to a nice healthy weight. Thank you so much for all your help and support Medical Vita Diet! Its fantastic to be me again." Five and a half years ago Loralee weighed 124kgs. 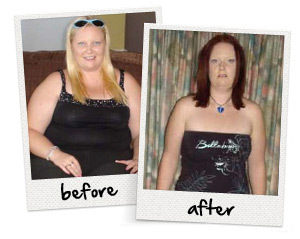 15 months later, after following the Medical Vita Diet weight loss program, she weighed 62kgs. Today she still weighs 62kg! 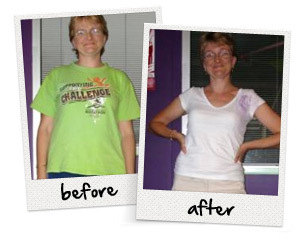 Loralee lost a total of 245cm from her body and dropped from a size 22 to 10. She couldnt be happier! "The first two weeks were difficult as I had to change my thinking about food but after that it was so easy. I really enjoyed the shakes and wasnt hungry even when I started working out at the gym (Fitness Connection, Southport Qld). Now I eat normally but Ive been trained to eat the right foods so I feel as though I eat a huge amount of food without putting on weight. If my weight does start creeping up I go back on the Medical Vita Diet and get back to my ideal weight. Maintaining my weight has been effortless. Its so easy for me to keep the weight off because I am just not tempted by fatty, starchy or sugary foods anymore." With a loving husband who was always offering words of support, plus a little bit of denial, it took me some time to recognise that my weight was getting out of hand. But, some unflattering photographs from a holiday to New Zealand sparked a moment of truth which encouraged me to change my life for good. Wearing size 20/22 clothes that were becoming a bit tight, I was heading towards the dreaded size 24. This was my peak weight of almost 120kg. This was a bit of a shock and I knew I had to do something. But, I had always been an ,I"ll start next week, kind of person, but next week never seemed to come around. Thats not to say I hadnt dabbled with a number of weight-loss programs. In the past, I had tried what seemed like absolutely everything to lose weight from pills and potions to ready-made meals and plans, but nothing seemed to work. All of these programs were too expensive and I just couldnt afford to keep going. Christmas in New Zealand Crunch time came when my husband and I returned to my native New Zealand at Christmas time. “We did the family thing for a week and then for the second week, we did the touristy thing and took lots of happy snaps. Upon returning home and looking at what I thought were happy snaps I soon realised how very unhappy and depressed they made me feel. I knew then that I had to do something. I knew I had friends who had done it and now looked great and were in total control of their weight and their lives. I loved all of the features of Vita Diet and the online forums were an especially big hit. I love to chat on the forums with anyone and everyone! Everyone is so, so supportive! I feel like I have made heaps of new friends and even have a couple of email buddies who I keep in touch with and we share photos and cheer each other on. Since then I have never looked back. I also joined a ladies-only gym and I am so happy I did. My life-changing program began in February 2008 and by September, I had lost 23.8kg, dropping from a size 20/22 to a size 12/14 and I am so happy about it. Two years on I am still going strong and have now lost well over 40kg and am mainly in size 12s now, and I now weigh nearly 70kg. I have kept the weight off all this time and find it very easy knowing that I have the ability to use the products at anytime. They taste great and are so easy and convenient as well as friendly on the budget. Being able to go online at any time of the day or night and chat to someone has been a big part of my success. And, having the additional support and motivation from folks out there in the forums was what kept me going. Do have faith in yourself and know that you can do it. It will take time to see results but dont give up. I work as an Administration Manager in NSW, and losing weight has changed my life in so many ways: I have so much more energy. I love my job. I love eating the right foods and look forward to my next healthy meal. And, with regards to food, I have actually put myself to the test; I went and bought some takeaway fast food one day and drove home with it on the passenger seat next to me. I could smell it and I could see it. I did not eat it at all as my brain was telling me that this was not good for me and I was not to eat it and the smell actually made me feel quite sick. When I got home I threw it in the bin. I was so proud of myself because I knew that I had finally beaten my inner demons. After years of yo-yo dieting, I finally found a way to get rid of the weight and keep it off, too. I fully recommend this to anyone and know they will find the success and happiness that I have. I would love to be able to share my story with the whole world and help others achieve what we all know is possible, we just need the help and support to do it. I have always wanted to write a book to help others learn and know they could do it but didnt know how or where to start. Maybe this could be my starting point. I am just an average everyday Aussie who won one of the most incredible battles of my life. I hope my story will help many people to reach the same goals in their life as I was able to because it is a very hard road but with the help and support of others who have been there I know we can all do it. Kim was motivated to lose weight when her local pharmacy the ALBION PARK pharmacy ran a weight loss competition for their customers. Kim started on the Medical Vita Diet and her weight was closely monitored by the pharmacy staff. In 8 weeks by following the MVD program closely , consuming two sachets a day and sticking to the suggested food lists, Kim managed to lose 13.5 kgs in 8 weeks. She was thrilled to be declared the winner of the BIGGEST LOSER COMPETITION WINNER!! 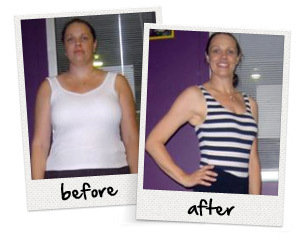 Karena wanted to lose weight quickly and by adhering to the Medical Vita Diet program and consuming two nutrient enriched supplements a day, she achieved great results. She was monitored by the experienced Jackie from the St Priceline pharmacy in St Clair in Sydney and lost an impressive 10.2 kg in 5 weeks! Sarah wrote to us “My husband and I started the Medical Vita Diet in January 09. Ian weighed a massive 150 kgs and I weighed 90 kgs. I was experiencing heart palpitations, felt quite depressed and struggled to put on his work boots. 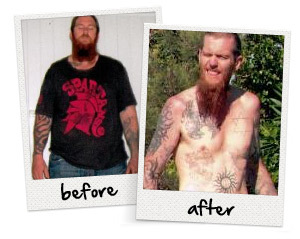 This Vita Diet weightloss program has literally saved his life. What was particularly impressive about Ian’s rapid weight loss was that he retained excellent muscle tone without working out or doing strenuous exercises. Thank you Ian and Sarah for your amazing letter and pictures. Your results are truly inspiring!!! 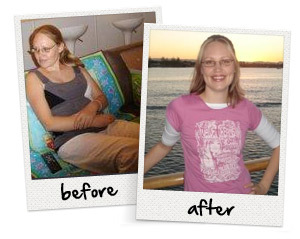 "I decided to lose weight with the Medical Vita Diet to change my life. And it did... I am so much happier now and feel I can deal with life better. The thing I enjoyed most about the Medical Vita Diet program was how it changed my way of thinking about food. My advice to others on the program is to STICK TO IT - the results are worth it!!!! The support I got from the ladies at Shoal Bay Pharmacy was the best thing ever." The NEW Vita Diet Ketone Sticks are Now Available! Monique Loses 20 kgs on Vita Diet. Why the Medical Vita Diet shakes are the best weight loss shakes on the market!